Founded by mechanical engineer Clay Guillory, who calls himself “a mechanical engineer by day, and a mechanical engineer by night,” Titan Robotics focuses on doing one thing and one thing very well: designing large 3D printers that are designed to last a lifetime. Among other applications that Clay has used his 3D printing know-how towards include prosthetic hands - which started as a request from a mother whose 8-year old boy was in need of a low-cost solution. Titan Robotics’ Atlas 3D printer was named after the famous Greek god who was known for fighting alongside the Titans and then later charged to bear the weight of the heavens on his shoulders. According to Clay, “the strength of this Greek god is an accurate depiction of the strength and size of this new 3D printer”. With over a year in development including real-world testing in various manufacturing facilities, the Atlas has proven to be a highly-accurate 3D printer that is capable of printing large prototypes reliably over time. According to the company, one beta user documented printing an extremely large accurate and functioning prototype with a total recorded print time of just over 200 hours. Fanuc claims that it is the first robot manufacturer to produce a heavy-duty robot designed to work safely alongside humans. Its CR-35iA robot can perform tasks involving payloads of up to 35kg without needing the protective guards and fences that have previously been needed for robots with similar lifting capacities. Although there are already several other collaborative robots on the market, most are designed for much lower payloads. The new robot will stop automatically if it touches a human operator. A soft covering material also reduces the force of any impacts and prevents human operators from being pinched by the mechanism. And if the robot comes too close to an operator, they can simply push it away. The covering has a green colour to distinguish it from Fanuc’s usual yellow robots. 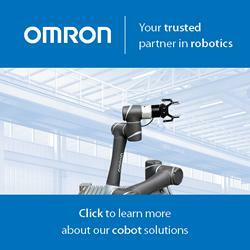 The six-axis robot is designed for duties such as transferring heavy workpieces or assembling parts. By avoiding the need for safety barriers, it is claimed to improve production efficiencies and allow higher levels of automation. Vicki Speed for Inside Unmanned Systems: It would seem that robotic systems could provide an extra measure of safety, as well as a higher level of efficiency and machine-consistent quality. Yet, to date, the use of robotic systems on construction jobsites has been minimal. The building industry, however, is looking with fresh eyes at robots—including at least three new systems expected to be available this year—with a focus on near-term efficiencies that make investment in the systems make sense. Demolition Days Among the first fully-realized applications of robots in the construction environment are those used to support work that comes at the end of a structure’s life, namely demolition. In fact, remotely operated demolition robots have been around for more than a decade. Robotic Building Blocks The short answer is, ‘Yes.’ There are robotic systems in development around the world that can lay bricks, set tile or finish concrete floors. Bionic Builders? While not autonomous systems, robotic exoskeletons, those high-tech wearable suits seen in futuristic movies that help mere mortals defend Earth against other beings, could be a very real part of tomorrow’s jobsite and a possible precursor to autonomous robots in the field.